The Squat and Respiration: When Should You Breathe? 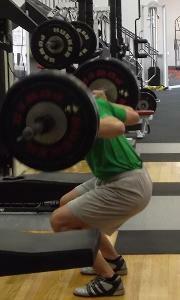 I have received some emails and questions regarding the squat with correct respiratory mechanics. This is discussed and explained in the Pelvis Restoration course. I am excited that people have the desire to understand the integration between the respiratory and pelvic diaphragms. I hope the attached document, The Squat and Respiration will help clear up any confusion. If not, please let me know. I wanted to update everyone with our quest in getting the Asics Foundations back and available for our patients. Back in November we asked our patients, PRC’s & PRT’s, and others who are familiar with Postural Restoration® to sign a petition to Asics or send a letter to them requesting that they don’t discontinue the Foundations. (Thank you Dave Drummer for writing the letter). In the letter we sent to Asics, we also included a video of what we look for in a good shoe and showing them the difference with a “bad” heel counter and how our patients cannot stay neutral in their pelvis with PRI tests being positive and then a “good” heel counter and how the PRI tests changed and were negative and our patient was neutral. It worked!!! They contacted me back in February and were working on bringing the Foundation back. I requested the Foundation 8, as it is the more superior shoe I have found for our patients with excellent heel stability (the newer Foundations were good, but not great). They were trying to find the mold for the Foundation 8 and if they couldn’t find it they were going to try to reproduce it and were going to come to Lincoln. Good news….they found the old Foundation 8 mold and they are coming back to production and will be available January 1st, 2014!!!!! Thank you to everyone who signed the petition and sent letters. Our teamwork paid off! We compiled a video highlighting “PRI Integration of Power and Strengthening Concepts with Modern Day Equipment, Philosophies and Techniques” and are excited to share it with you. These techniques are currently being carried out by Mike Arthur, Director of Strength & Conditioning at the University of Nebraska-Lincoln. Mike was one of our featured speakers at our annual Interdisciplinary Integration symposium. There is limited space available yet at the Postural Respiration course sponsored by the University of Michigan Health System Continuing Education Program. The course will be taught by James Anderson on April 27-28th in Ann Arbor, MI. To register for this course, contact Amelia Hippler at 734-936-4376. Check Out PRI’s New Featured Interview with Kevin Neeld! Be sure to check out this month’s featured interview with Kevin Neeld! Kevin is the President, COO, and Director of Athletic Development at Endeavor Sports Performance in Pitman, NJ. Since becoming introduced to the science of Postural Restoration® in 2010, he has completed several courses, and earned the designation of Postural Restoration Trained (PRT) in January, 2013. Kevin is a former collegiate hockey player, and continues to have a strong passion for working with hockey players. He is the author of Ultimate Hockey Training, a comprehensive resource on long-term player development and year-round off-ice training methods. Recently, Kevin has joined the US Women’s National Hockey Team as a Strength and Conditioning Coach, and has been an invited guest to NHL training camps to assist in the testing and training of the players. To read Kevin’s full interview, CLICK HERE! We had a great two days discussing Athletic Performance at our 5th Annual Interdisciplinary Integration Symposium! It was by far our largest group with over 115 attendees. A big thank you to all those who attended and the speakers who contributed to the integrative learning: Mike Arthur, Ken Crenshaw, Heidi Wise, John Cook, Dr. Kris Berg, Eric Cressey, Drew Marchesi, and Ron Hruska! In addition, we had several requests for the Sweet Crispix Chex Mix recipe, so HERE it is! Seattle, WA Pelvis Restoration Course Added! Due to the lengthy wait list we have for the April 20-21, 2013 Seattle, WA Pelvis Restoration course, Lori Thomsen will be teaching again June 8-9, 2013! If you are interested in attending this date, please register or contact me today! Spots are limited so register today! Evidence Based Treatment: What is the A-B-A Single Subject Experimental Design? Lucy McKee, who is currently in one of her final physical therapy clinical rotations at the Hruska Clinic did a wonderful job of explaining how Postural Restoration is evidence based in our treatment approach with the A-B-A single subject experimental design in her recent blog. I couldn’t agree more with Lucy, and her patient case examples are great. CLICK HERE to read more about why testing and re-testing is so important in our assessment and treatment!